Choosing the best grinder for weed can be very difficult – especially if you have never bought a grinder before. So we thought we’d let you know why the Golden Gate Grinder has also the features necessary for grinding marijuana effectively each and every time you use it. Whatever you do, stay clear of plastic grinders. These are more than likely made in China and are of poor build quality. As you begin to use a plastic grinder, tiny particles of plastic become detatched from the teeth of the grinder and become contaminated within your material. Plastic is carcinogenic so this is the last thing you want to be doing. The Golden Gate Grinder is made of anodized aluminium and the teeth don’t degrade over time. No aluminium will ever become contaminated within your material. 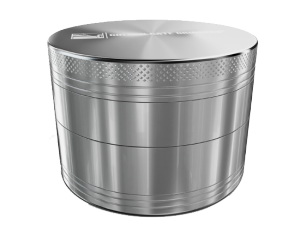 In order to ensure your grinder lid doesn’t fall off during grinding or when stored, it is important for your grinder to have a magnetic lid which seals the lid to the body of the grinder. The Golden Gate Grinder has powerful neodymium magnets which ensure a tight fit. You can even hold the grinder by the lid and shake it about and it still won’t come loose. A tight lid also ensures no smells come from the grinder itself meaning it can be carried around in public without causing a stir. Not many products nowadays come with lifetime warranties. This is what the Golden Gate Grinder comes with. If your grinder for any reason stops functioning, then simply send it back to use for a no quibble no hassle replacement. This is how confident we are in the build quality of the Golden Gate Grinder. We’ve manufactured this grinder to last! It is important for the best grinder for weed to be made of one piece of anodized aluminium. If the body of the grinder and the lid of the grinder are two different colors, this means they are made from two separate parts. Each piece of the Golden Gate Grinder is CNC’ed from one piece of aluminium. The lid and teeth of the grinder are one piece, whilst the second part with teeth and holes are one piece meaning flawlessly compatibility. Those grinders made of two separate pieces are not reliable and should be avoided as the build quality will be very shoddy! Yes, that’s right, the Golden Gate Grinder currently has 700 customer reviews, with 621 customer reviews giving the grinder an incredible 5 stars out of 5 9 (as of June 2015). A lot of reviewers praise the outstanding build quality and reliability of the grinder compared to others they have used in the past. The teeth are also singled out for praise as they effortlessly grind through the material in only a few turns. If this many people love the Golden Gate Grinder, then I’m sure you will too. You can purchase a Golden Gate Grinder through Amazon here.